With many apologies again to my Four-in-Art friends for my lateness, I'm dropping in to share my quilt for this quarter, Birch. Our group has been working this year on the theme of Literature, and my fourth quilt is inspired by Anna Karenina by Tolstoy. It's a really wonderful, atmospheric novel, full of the most human characters (and, bonus, its a whole lot easier to read than War and Peace). I wanted to make a quilt about the power of a book to evoke a particular image or feeling. I last read Anna Karenina quite a long time ago - on the Trans-Siberian railway, in midwinter - and the image in my mind has always been of snowy birch forests. I had a look back at the text of the book when I started my quilt and could only find one reference to birches, so my memory of the book is probably all muddled up with memories of the journey, but never mind! That's the image I had in my head. or it could be the bark on one birch trunk. It is heavily quilted to suggest more trees, or bark texture. The 'coloured' strips are the same fabric as the body of the quilt - I cut a large section and ran backwards and forwards with variegated aurifil before cutting and piecing it. To be honest, I'm not sure this quilt is really finished, but it completes my four on the theme of "Literature" with Four in Art. We are a friendly group, who all have very different styles and approaches, who come up with an overall annual theme to work on, sometimes with quarterly sub-themes for extra inspiration. The group is kept to a size where we are close enough for us to communicate easily with each other, but a spot sometimes opens up so if you're interested in joining let me know in a comment below. Desire to expand their creativity. Have a body of work that members can review, preferably a blog. Make a year commitment to the group and do their best to make deadlines unless some crazy life occurrence happens. 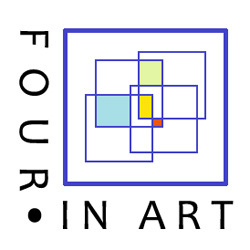 Be willing to review other Four in Art work and leave a comment within the first week of publishing. Oh Catherine - it's lovely and so perfect! Yes, they are birch and to me, most things Russian bring up that exact image (Dr. Zhivago maybe?!). I love the simplicity of the vertical lines with the complexity of the horizontal stitching. And your series of 4 is pretty impressive - great job! Hope things are back to normal (or close)! I love this quilt! It perfectly communicates that idea of starkness, of a snowy landscape, and certainly the specificity of a birch tree/s. So glad you were able to add to your series-- they are striking when viewed together ( and I like your four much better than my four). I love it! It's odd that something so simple can be so interesting and pleasing to look at. Another wonderful quilt Catherine. You have produced such an amazing set of quilts for this theme. This is so pretty, Catherine. I love that it can easily turn for a whole new effect. Thanks for sharing all the previous quilts, as well. It was nice to see the whole year together. A beautiful set! Birch trees are my favourite and I really love your interpretation of the scene. A perfect snowy birch forest in midwinter. Magical. I would love to make one like yours with your permission. I keep coming here to look at Birch, I really love it. It reminds me of the paintings in which just a few brush strokes create a whole image. The birches are beautifully rendered! It feel like a snowy day to me. The background is really perfect to set it off too! cheers! This is a brilliant interpretation, capturing the spirit of the birches and the snow perfectly. I'm very envious of you reading Anna Karenina on the Trans Siberian Railway! You've made a stunning selection of quilts for your literature theme. If you have a space in your group, I'd love to join. This is a beautiful, serene piece of work. I get the birches of course, but also really like it horizontally, when those lines could be read all sorts of other ways (tracks in the snow, railway lines...) Using the Aurifil in this way has allowed you to be really delicate - very clever. This is so beautiful, it took my breath away. You know I am not a quilter but a piece like this really makes me wonder why not. Just swoon-worthy. Another one that's so effective, I really like how you used the horizontal lines. And reading that novel on the Trans Siberian railway sounds like the ultimate setting!